The Nexen WinGuard Sport tyre is designed to offer better tyre mileage and performance during winter conditions. The multi sipes seen on the tyre are of high density and thereby the tyre’s life is increased. These sipes also help in improving the braking grip on snowy and icy roads. These winter tyres come with asymmetric tread pattern that will help in offering better traction on snow and dry roads apart from improving cornering ability. 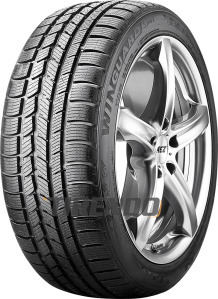 The Nexen WinGuard Sport tyre specification that perfectly fits 15 inch wheels is: 185/60 84T, 185/65 88H and T, 195/60 88H, 195/65 91H and T and 205/60 91H that are read as width/height and load speed index respectively. The tyres that will be an ideal fit for 16 inch rims range from 195/45 84H to 225/60 102V. The tyres suited for 17 and 18 inch wheels that are available at Tirendo.co.uk are from 215 /50 95V to 245/45 99V and from 215/40 89V to 255/45 103V. The specs of the tyre for 19 inches are: 235/55 105V, 245/40 98V, 255/35 96V, 255/40 100V and 275/40 105V.